Home/Worse Off Today Than Before? David W. Gill: How did you-a Stanford “Young Republican” earning an MBA and Ph.D. in business, an Air Force Captain during Vietnam, and a Harvard business school professor-end up as an anti-corporate, anti-globalization prophet out here in “ecotopia” on Bainbridge Island, so far from the center and the mindset of the business world? 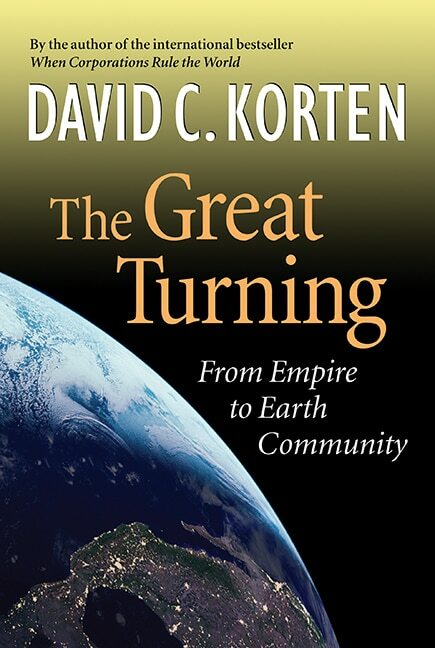 David C. Korten: Thirty years of working in Third World countries convinced me that the development models we were spreading throughout the world were actually deepening human poverty and inequality, and producing environmental destruction and social breakdown. My focus at Stanford was on business organization. We were trained to trace problems back to the way decision-making processes are organized. My analysis led me to conclude that we have created a global system of economic institutions programmed to behave in a sociopathic way. We had a very serious problem but very little discussion of how the system might lead to such negative outcomes. A lot of my analysis was developed in conjunction with Asian colleagues from nongovernmental organizations working with rural poor. At one point they told me that if I really want to be helpful I should go home and try to educate the American people to understand what America policies and American corporations are doing to the rest of the world. It came to a point where I decided that was exactly what I needed to do. Gill: So you are not blaming these problems in individual evil capitalists but on an organizational structure and a system of relationships? 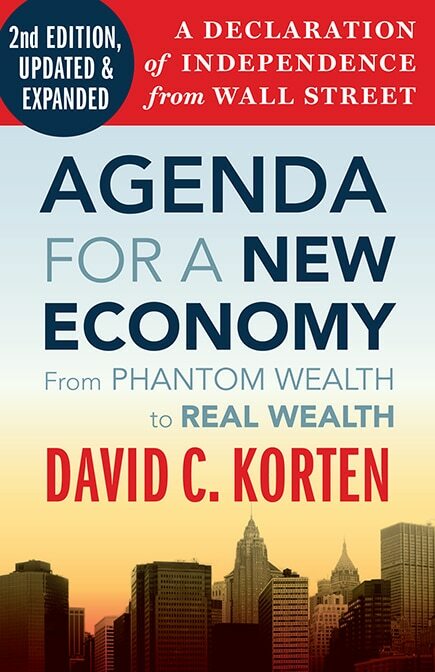 Korten: My focus is on the economy as an organizational system that is structured to reward the worst in us. There are certainly some extraordinarily dishonest and greedy people who use this system. But most in the corporate system are ordinary decent people, many of them with deep spiritual and ethical values. They are caught in a system that gives them very little scope to behave in any way other than what the system demands. Gill: How do you measure whether people are worse off or not? A friend of mine who dropped out of the corporate fast track and moved to China a decade ago to teach and to live a simple life among the people, insists that corporate development has brought real improvement to the lives of ordinary Chinese people. model cars, shopping malls, housing colonies, and so forth. It looked like incredible progress, but conditions for most people became increasingly harsh. It’s so easy not to see such divisions. Albert M. Erisman: Certainly poor people in these environments are worse off than the wealthy but is the average person actually better off in this environment than without it? Korten: That part is very elusive in terms of hard data. But part of the dynamic that we miss is also that the development process pushes more and more people off the land and breaks down their community structures. Incomes may be rising, at least marginally, in situations where people are in fact getting worse off because they are being disconnected from their main subsistence production and from the social security systems of the village and extended family as they are forced into the money economy. Indonesia was one of the first countries I visited as a student resident in business school back in 1961. The changes in Jakarta since then are just incredible. And yet, out beyond the fringes of modern development and you will find incredibly degrading, putrid, fetid conditions that people are forced to live in. There was a lot of poverty in Indonesia when I first visited there but not the same levels of degradation as today. Gill: Despite today’s huge problems aren’t we in some respects better off than in past? Was Russia better off under the Communists than in today’s globalized corporate economy? And before 1917 for peasants under the czars? Did Western Europeans have it better in the Middle Ages? or when the plague wiped out one-third of the population? Korten: Following World War II, we moved into the development era and a lot of the statistics were improving until some time in the 1980s. Then the numbers started turning around in many countries in terms of education and life expectancy. Even in Africa economic growth turned negative in many countries. The trends vary from place to place, of course, so generalizations are tricky. When I first started getting a sense that we were not only failing to make the progress that we claimed but were actually making things worse for many people, I assumed that it must be just a local phenomenon. But it was not just local. Obviously the situation is extraordinarily complex and there are competing forces and trends. Japan, South Korea, Taiwan, Thailand, Mexico, Brazil, Argentina, or Chile were at one point identified as emerging economies. Massive amounts of money flowed in and supercharged the economy as growth indicators headed for the sky. Then something happened, the economy lost favor, the bubble burst, and the house of cards collapsed. People’s lives go up and down as economies rise and fall. I believe that overall we are in a pattern of decline and that the path we are on cannot work in terms of bringing everybody into prosperity. 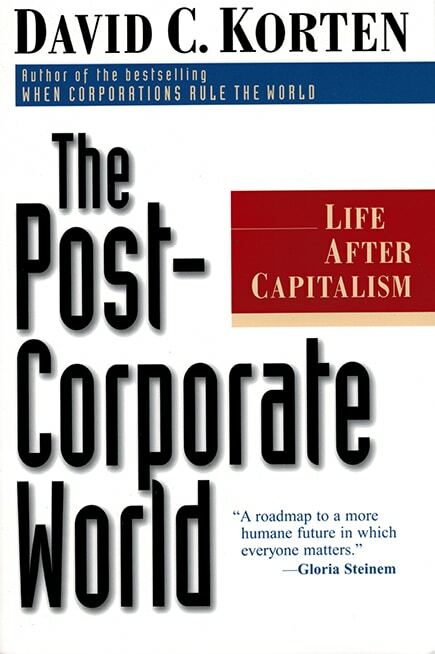 A few critics of corporate globalization could reasonably be interpreted as suggesting that there hasn’t been any real human progress since we left the caves and that the ideal for the future is to return to the past. For myself, I have no desire to return to any sort of idealized past. The challenge we face is to create a very different future that makes the best possible use of our technology, of our capacity for global communication and exchange, and for cooperative activity. Gill: So you see those as positive things about technology. Korten: Technology is a very mixed bag. Erisman: But you wouldn’t want to give up these two seventeen-inch flat screens on your desk. Korten: Twenty inches! I would be delighted if I did not have to spend my life sitting behind a computer writing about why the world is falling apart. Erisman: World population growth is one of several big issues we must face. And yet the thrust of your argument seems to be that the corporation is the villain. Are corporations the cause of population growth? Why is this the focus? Erisman: A former CEO at The Boeing Company said to me, “Al, in some ways you have more power in this organization than I do because you can actually impact the way people work. My decisions get filtered through all sorts of people and communities to the point where it’s very difficult to actually produce change.” It’s very difficult to create change. Someone said that every person in the organization from CEO to the worker on the floor actually controls only about 15% of his or her world. This seems like a very small number but a great deal can be done with that 15%. Korten: I’m talking about formal, legal authority. In a sense none of us feel that we are ever in charge and it is very difficult to bring about positive change but the CEO can decide that the Boeing headquarters is going to abandon Seattle and move to Chicago. At least some would interpret that as helping break the human bonds of obligation so it becomes easier to fire people and to move production to China and elsewhere in the world. Erisman: In fact, though, the CEO moved to Chicago so that the person who remains in Seattle and has responsibility for those decisions has the flexibility and room to make his own decisions. Korten: But doesn’t the CEO ultimately decide how much of Boeing’s production moves off shore? Erisman: No. The person responsible for that production makes that decision. That person is responsible to the CEO to deliver against his objectives but how he does it is decided by him and his team. It is a much more complex system than you are imagining. Korten: It is much the same thing when the CEO delegates authority and responsibility for financial results that leave the production manager with little choice other than to move production off shore. Indeed, it is similar to the process by which financial markets delegate their ownership authority to the CEO and hold him accountable for financial results. One thing over which the CEO has little or no power is the question of whether the corporation will give priority to financial return over ethical concerns for people and the environment. Obviously, the largest corporations couldn’t function without the CEO delegating a great deal of responsibility for working out the details. Erisman: Incredible amounts. At General Electric, the biggest corporation in the world, CEO Jack Welch said that his job was to develop people. He didn’t know anything about refrigerators or aircraft engines and let the people running those businesses make the decisions how to build them and where to put the plants. 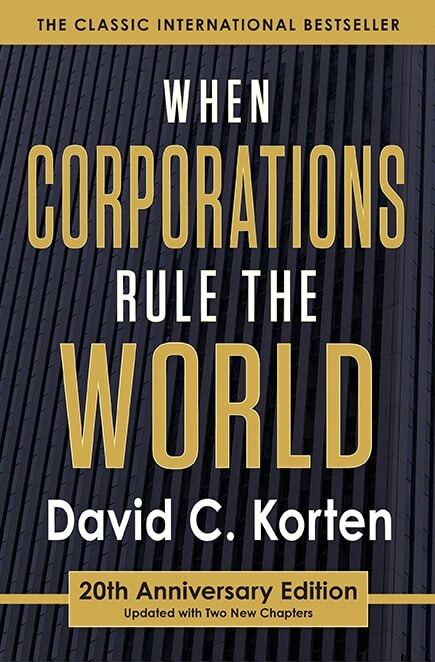 Korten: That’s his choice but he can withdraw that authority at any time and he can at any time fire any one of those individuals if he thinks that they are not focused adequately on the corporate financial objective. Erisman: But if he operated in the way you describe, GE would be very unsuccessful and he would be gone. people working in the corporate environment have a hard time understanding the issues I’m calling attention to because things look so different from inside the corporation. I’m not sitting within the firm so I look at problems from the standpoint of society and how society is organized. Things look very different out here. Within the corporation decisions are shaped by the legal fiduciary responsibility to maximize shareholder return. But if you step back, the statistics on increasing inequality are very clear. We’ve got a world of six billion people roughly eighty percent of whom are living in conditions that are not only substandard but often subhuman. Stepping back, you see a society pushing the limits of the ecosystem and systematically destroying the life support system which is ultimately the foundation of all real wealth. Without it we can’t live. Erisman: It is true that Jack Welch eliminated a lot of jobs when he started in the position, and it is not my place to defend or criticize that. What he has said, however, is that had he not taken a large, sluggish company and streamlined it, it would not be a vibrant company today, with a positive presence in its communities. But I’m not disputing your broad concerns. I’m trying to understand where you’re going with the argument. Opportunity may be more important than income, for example. Korten: It may be. Ultimately the distribution of ownership is more important than the distribution of income because it is the foundation of income distribution and plays a major role in determining who has opportunity and who does not. In very simple terms, we have a growing population, increasingly unequal in its purchasing power and its decision power, competing for what is a shrinking base of the real foundation wealth of the land and resources on which we depend to sustain our living. The greater the inequality in purchasing power and ownership control, the more the folks at the topto Our are in a position to rewrite the rules, acquire more and more control of the real wealth and property in society, and exclude those who are not part of the elite structure. Erisman: Business consultant Don Tapscott has suggested that the Internet creates a more transparent world in which unethical practices will inevitably come to light and force CEOs to eliminate these problems. This says that corporate interests must include more than just profits and power. Korten: It is true that customers and shareholders sometimes successfully take corporations to task for bad behavior, but as we’ve seen in the recent accounting fraud scandals, a great deal of damage can be done before customers-or even shareholders-realize what is happening. Erisman: No doubt. But my point is that the system is more complex than you’re suggesting. The CEO is not just making decisions narrowly based on money but must include the values of people. He cannot just do whatever he wants in a vacuum. Transparency creates some correction in the system. Korten: Enron, Worldcom, AOL Time Warner, Qwest Communications, Global Crossing, Waste Management, Sunbeam, Halliburton, Xerox, Harkin Energy-the list of major companies so focused on profits-and stock options-that they have been cooking the books with the help of their auditors has become so long that even many business leaders and analysts are saying the problem is systemic. Our forebears asked whether we wanted to continue having kings and organizing our politics around a monarchy. Now some kings were pretty good. Kings don’t really control everything. Things are not entirely their fault. But ultimately people decided it is really not a very good way to organize because it concentrates too much unaccountable power, with an enormous potential for abuse. I would argue that we have created something that is relatively akin to a monarchy in our economic system. The powers of CEOs in our largest corporations probably exceed the powers of most kings in the past, even if our CEOs don’t quite have the liberty to literally behead people at will. Erisman: I’m sympathetic to a lot of the concerns that you raise, such as the growing inequality and the environmental challenge. But I was very frustrated with your book When Corporations Rule the World because many people who need to hear your concerns won’t be able to because of extreme or unsubstantiated statements you make. For example, about the WTO protests in Seattle, you wrote: “Thousands of protesters committed to nonviolent resistance courageously stood their ground against the violent police battalions.” But while some of the protesters idealistic, courageous people., some of them were troublemakers. And while some of the police were repressive and violent, some were not. And you made the statement “tens of thousands of people are living well, hundreds of thousands enjoying higher levels, but billions are in an evermore desperate struggle for survival.” This quantification of the problem appears to me to be an exaggeration. Korten: If you’ve got time, I can show you the videotapes of the Seattle WTO protests. And if you read beyond the introduction of When Corporations Rule the World you will find the generalizations you mention are well documented. Erisman: You do provide data, but not to support the implication of your statement that the vast majority of people live in poverty. That a substantial number do (as supported by your data and the data of others) is of concern enough. The exaggeration may cause people who need to hear you to dismiss your whole argument. That is my frustration. Korten: I appreciate your frustration. To be perfectly frank, the parts you were reading were added in the second edition. When I wrote the first edition I was already pretty skeptical of the corporate system and the possibility of change coming from within. But by the time I did the second edition I had no remaining illusions about the possibility for the system changing itself. The system itself, by my assessment, virtually precludes the depth of the change that is necessary, given the constraints under which corporate management works. I recognize that my words are not likely to resonate with people within the system; they’re not directed to those people. My message to people within the corporate system who are really concerned is don’t waste your considerable talent and resources trying to make incremental changes inside but bring your talents outside and help us create an alternative system. Gill: If corporations as we know them are essentially beyond reform, what would you replace them with? 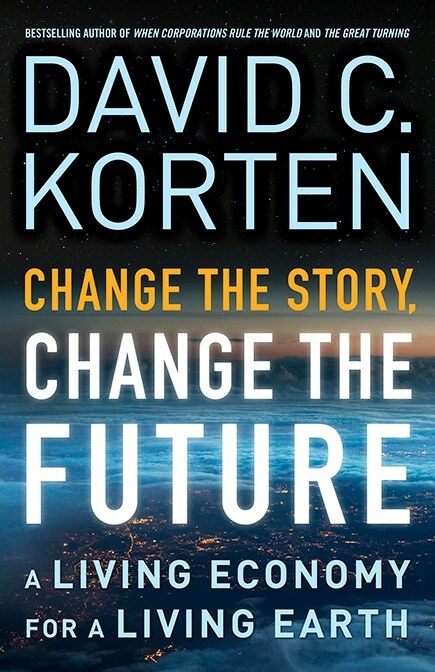 Korten: We must begin to make choices not in terms of what will maximize shareholder value but what will maximize the living conditions and well being of all the world’s people. And we must not only protect what we have but restore a lot of what we’ve destroyed. If we step back and ask how we might actually design a deeply democratic system, grounded in equity, and geared to providing people with the means of livelihood to live good lives, my basic thesis is that it would look very much like a market economy. What I call a real market economy. 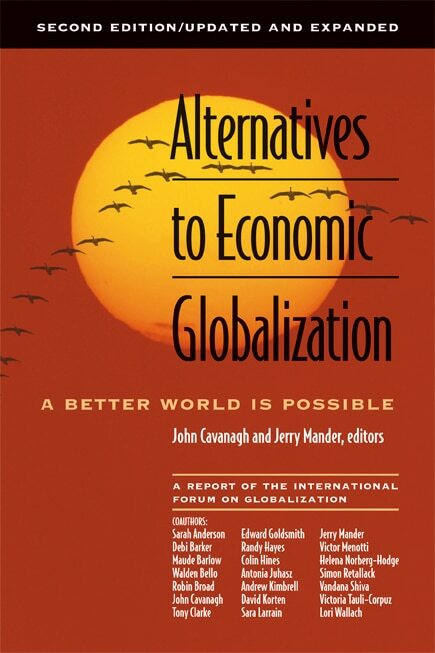 In my other book The Post Corporate World I draw a very clear distinction between a capitalist global economy and a real market economy. One is structured to concentrate wealth and power and the other, in the genre going back to Adam Smith, is about a system of smaller enterprises that are rooted in community and engaged in responding to people’s needs. It would be a system of predominantly small and medium enterprises. You might have some very complicated networks and we may need some larger companies. But in terms of meeting most of our needs, I think we could all agree that we don’t need a transnational corporation to run hamburger stands or even to grow our food, particularly if we’re growing it in environmentally healthy and sustainable ways. Think about an economic system in which enterprises are accountable to the people who work in them or to the communities in which they do business and are actually owned by their workers, managers, the community, or consumer co-ops. The financial side is of course there and it is reasonable to make a fair profit. But the firms would exist not solely for making profits but to provide livelihoods. Erisman: Would this alternative system produce the 747 that took you to Indonesia and the 20 inch flat panel displays that allow you to write? Korten: I don’t know whether it would or not. I would not be too disturbed if we created a world in which everybody had a secure diet, a decent place to live, good education, and adequate healthcare, and didn’t have twenty-inch LCD computer screens and Boeing 747s – if that trade off turned out to be necessary. Erisman: I don’t believe that small and medium sized enterprises can produce large complex products like airplanes and flat panel screens. Gill: What do you do with examples of corporations that seem to operate in a humane, positive, value-driven way while achieving long-term financial success? Aren’t companies like AES, Southwest Airlines, Lincoln Electric Motors, the old Hewlett-Packard, the Body Shop, and Ben and Jerry’s examples of another way in the corporate world? Korten: It probably is possible for an individual company for a period of time to be more responsible than the norm within the existing system. But I don’t think that should deflect us from the larger set of issues of whether this is a suitable way to organize a society. I would argue that a corporation like Enron defines the system more than, say, Southwest Airlines. Gill: But isn’t Enron evidence that a serious corporate cancer will eventually be rejected? Korten: Yes, but remember that Enron was one of the darlings of the system until it crashed. One of the interesting characteristics of Enron, which I believe reflects the deep values of the corporate system, is that the company did not produce any actual goods or services. It was engaged in profittaking based only on trading and market control-and it turns out “aggressive” accounting. Enron was making money off of money without dirtying their hands in the production of any goods and services. Enron epitomizes the dishonesty, the lying, and the buying of politicians, the manipulation of markets, the ripping off of shareholders and customers, and the corruption of the auditing system. Gill: But doesn’t everybody agree with that? Nobody is saying we must rip off our shareholders better next time. They’re saying we must be sure we’re not doing any of this Enron stuff because we would surely be exposed and undone.